Musicians Hypnosis is the most comprehensive and powerful self-help program specifically produced for Musicians in any format and on any platform. This app can do more for your playing than ten years of practice ever will because it works at a deeper level. It's like a 'software update' for your musical mind! -Imagine replacing nerves and insecurity with Confidence and Charisma. -What could you achieve if you improved your Sight-Reading? -Do you want to perform at your best in Exams and Auditions? -Do you want more freedom when you Improvise? -What would you Compose if you let your unconscious do it for you? -Ever wished you could Remember Lyrics? -Hung-up with your Time-keeping? Become rock-steady using your inner mind. -Want to spend less time Practicing, yet achieve MORE? All this and more is included in this powerful App. - New Interface (CLICK THE 'ADD' BUTTON! One reviewer in the US didn't spot that, so ignore the silly review. Works fine on iOS 9 too!). Born from the market-leading ‘Self-Hypnosis For Musicians CD’, the Musicians Hypnosis App adds the versatility and functionality of the iPhone making it the most truly customizible and flexible program around. -Using hypnosis you can take standard ‘positive visualization and mental rehearsal techniques’ and turbo-charge them. During hypnosis the Visualization track shows you how to learn at a deeper level than you could ever do normally. -Ask your unconscious mind for help and guidance. The ‘Question’ track helps with career decisions as well as less life-changing choices. This track saves careers... and possibly even lives! - Don’t like making Announcements? This ‘Public-Speaking’ track gives you the confidence to speak with authority, confidence and even humour. -The Pre-Gig Pep-Talk was said to be worth the price of the Self Hypnosis For Musicians CD alone! Here, the most powerfully effective version of this hypnosis session will help you play ‘out of your skin’ on every gig. Be excited! Not only can you choose from the topics mentioned above, you can also choose from three different Hypnotic Inductions, ‘Deepeners’ background sounds. The system is so flexible you’ll never get bored with the ‘same old spiel’. This really is a program that you’ll use for years and years... maybe your whole career. Also included in the App is an informative ‘podcast’ which explains how and why Hypnosis works. It also details the content of the various suggestion tracks. It is strongly recommended that when you buy this App you listen to this first. 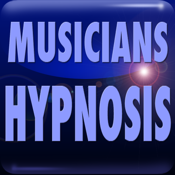 There is more information on the Musicians Hypnosis Website: www.musicianshypnosis.com including testimonials from ALL iTunes stores throughout the world.